the counting of cells, especially blood cells. flow cytometry a cytometric technique in which cells suspended in a fluid flow one at a time through a focus of exciting light, which is scattered in patterns characteristic to the cells and their components; cells are frequently labeled with fluorescent markers so that light is first absorbed and then emitted at altered frequencies. A sensor detecting the scattered or emitted light measures the size and molecular characteristics of individual cells; tens of thousands of cells can be examined per minute and the data gathered is processed by computer. a method of measuring fluorescence from stained cells that are in suspension and flowing through a narrow orifice, usually in combination with one or two lasers to activate the dyes; used to measure cell size, number, viability, and nucleic acid content with the aid of acridine orange, Kasten fluorescent Feulgen stain, ethidium bromide, trypan blue, and other selected staining reagents. 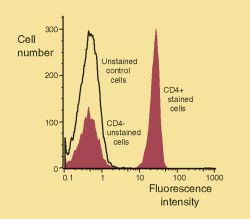 Cytometry performed by suspending cells in a liquid and passing them through a light beam, often after applying fluorescent stains. The measured characteristics of the scattered light correlate with cell properties such as volume, morphology, and pigmentation. a technique in which cells suspended in a fluid flow one at a time through a focus of exciting light, which is scattered in patterns characteristic to the cells and their components. They are often labeled with fluorescent markers so that light is first absorbed and then emitted at altered frequencies. A sensor detecting the scattered or emitted light measures the size and molecular characteristics of individual cells. Tens of thousands of cells can be examined per minute and the data gathered are processed by computer. Lab medicine Analysis of biological material by detecting the light-absorbing or fluorescing properties of cells or subcellular fractions such as chromosomes that have been labeled with monoclonal antibodies raised against various antigens, tagged with fluorochrome markers and passed in a narrow stream through a laser beam; the cells can be separated with automated sorting devices by size, intensity and type of fluorescence, and DNA ploidy analyzed. See Cell sorting, Cf Image analysis, Laser scanning cytometry. A method of measuring fluorescence from stained cells that are in suspension and flowing through a narrow orifice, usually with one or two lasers to activate the dyes; used to measure cell size, number, viability, and nucleic acid content. A medical laboratory technique used in machines that automate the analysis of cells or cell nuclei that have been labelled with fluorescent dyes specific for certain substances. The cells are suspended in a fluid, move in a flow stream, and are illuminated by a laser beam of known wavelength. The emitted light from the fluorescent markers are detected by photomultiplier tubes. Up to six variables can be measured simultaneously. a method for sorting and identifying CELLS without culturing them. A moving fluid containing, cells, for example BACTERIA, is forced through a small opening. The cells become arranged in a line. If the fluid is then illuminated with, for example, a laser beam, the amount of light scattered can be used to determine the shape, size and density of the cells, and this is analysed by computer. Cells that are naturally fluorescent or that can be tagged with fluorescent dye can be detected by virtue of the fluorescence they produce. n technique used to determine cell size and granularity by shining a strong, focused beam of light on the cell and then measuring the scattered light. a technique used to identify and separate different types of cells based on detecting and measuring the fluorescence emitted with a laser light beam. See also fluorescence microscopy.